My mom’s house, which she recently sold, sat across the street from one with a big tree in the yard. To a kid, the little, fiery olive or pear-shaped things that fell from the limbs were intriguing to say the least. I can remember picking them up, peeling them, and eating the sweet flesh. 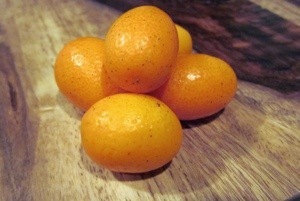 We called them kumquats. But, my best memory comes from the day when I threw one as hard as I could at a girl who lived down the street. I believe we’d had an argument.. or something. I was a kid, I didn’t know any better. That little sucker (the fruit, not the girl) hurdled through the air like a bullet. It hit her on the top of the head and bounced off like a bingo ball firing out of the chute. I felt like Nolan Ryan. I also felt bad, okay? But, she laughed it off, after holding her head for dear life and walking home. It didn’t affect our friendship. 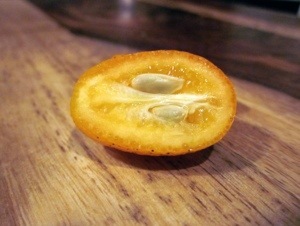 Anyway, it wasn’t until recently that I decided to revisit the shrunken citrus-like fruit. Turns out, what I remember from childhood was probably a loquat, a fruit with a thin, peelable skin, orange-mango-like flesh, and a brown inedible seed. Either way, my memories had me honing in on the bright sight coming from the clamshells in the produce department. They are kumquats, and nothing like what I remember from the walk-by fruiting incident I committed in Florida. They are as bright as the Sunshine state’s rays. 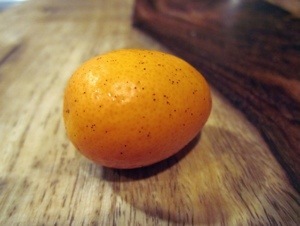 The word “kumquat” is Chinese for gold orange. You don’t have to peel them, though. In fact, it’s the opposite of an orange. The peel is sweet, while the insides are sour. You can eat the whole thing, except the seeds. To me, the overall flavor resembles orange zest. It’s bright, almost floral, but intensely bitter. 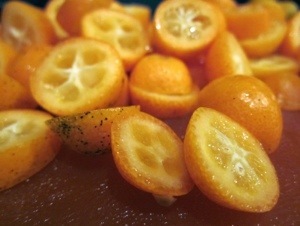 You can eat the kumquat raw, but it’s often used in cooking. Usually it’s used in jams or marmalades because the sugar offsets the intensity. You can candy it, or muddle it for a cocktail. I chose to cook with it. You can prepare your chicken however you’d like. I seasoned boneless chicken pieces with salt and pepper, then browned them. 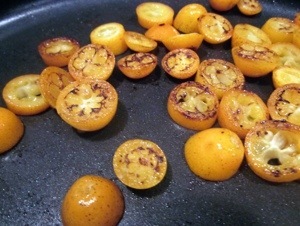 In a pan, bring the olive oil to a medium high heat and toss in the kumquat slices. Let them brown on each side to caramelize their natural (minimal) sweetness. Then deglaze the pan with the vermouth. Let them bubble up for a few minutes, then add in the broth and thyme. Boil that mixture for 15-20 minutes. You want it to reduce significantly. Add in the vinegar, sugar, and a big pinch of salt. Cook on medium high for 5 minutes. 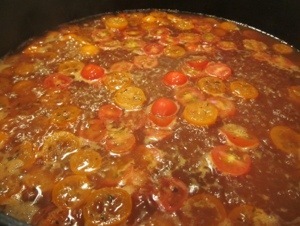 Add in the tomatoes. They add some natural sweetness. 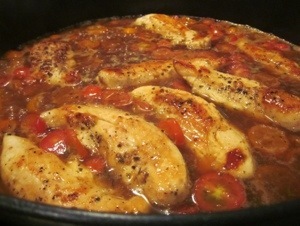 Put your chicken, and any juices that leaked onto the plate, back into the pan and let it all hang out for about 5-7 minutes. 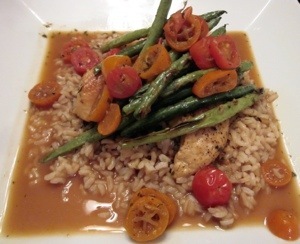 Put your chicken on a bed of rice, and pour on the kumquat sauce. I did enjoy this dish. The flavor was intense, bright, and full of flavor. But at times, it was a bit bitter, even for me. It could certainly stand to have more sugar – but I was trying to keep the amount low for health reasons. If I were to make this again I’d use shrimp, because the natural sweetness of the shellfish cries out for citrus. I might even add in coconut milk or curry to cut the bitter bite. The kumquat is certainly worth tasting. Try it on a salad (with a sweet dressing), or try my dish above. The mildly sweet, highly sour one-two punch is an experience no other tiny, orb-like fruit could provide. I promise. They’re typically in season from November to March, but you can usually find them any time at specialty stores like The Fresh Market. At the very least, this ingredient introduction took me down memory lane. Plus, it’s a funny word. Say it five times. Then watch the first 2 minutes of this clip from The Golden Girls. Tip: Instead of using a veggie as a side, incorporate it into your main dish. 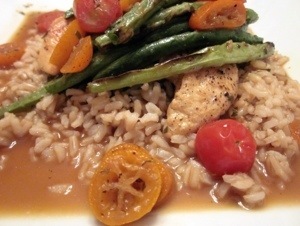 For my chicken with kumquats, I added in roasted green beans. The color was vibrant and really played off the orange from the kumquats (go ‘canes!). You get a bit of a crunch, a slight sweetness, and a savory kick from that one vegetable. 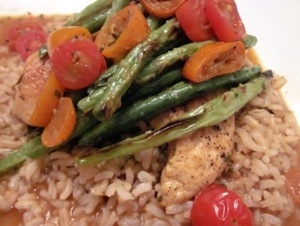 Plus, it really stands out from that drab brown rice. And if you haven’t roasted fresh green beans, you’re missing out. Wash them, cut off the tips that were attached to the vine, then spread them out on a cookie sheet. Drizzle on some olive oil, add a few sprinkles of kosher salt, freshly cracked pepper, and garlic powder. Roast at 400 for about 15 minutes or until parts of the green bean get slightly caramelized. Looks like you can order them online too! http://kumquatgrowers.com/ in Florida.